Injured during a train robbery, Regina Shelton awakens with no memory of who she is- and in the arms of the most handsome man she has ever seen. The dangerous stranger calls her “Elizabeth,” and his touch sets her blood racing- impelling her toward a romantic destiny not rightfully her own. 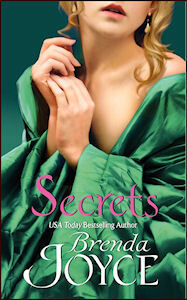 Slade Delanza has finally found the missing heiress who came west to wed his brother James. But now, James is dead- and the rugged loner is expected to marry wealthy “Elizabeth Sinclair” himself, in order to rescue his family’s California ranch from ruin. Though he aches to possess his innocent young bride, Slade’s honor demands that he deny his own desires. And he vows to resist temptation, never dreaming of the stunning secrets that could seal their love- or tear them apart forever. A mesmerizing tale of duty and desire—from the most sensuous voice in romantic fiction today. Regina stared out of the train’s window at the passing scenery, a vista of sunburned saddleback hills thrusting against the sky. “An earl does not rank with a duke.” She recalled the last time she had seen her parents, before they had left Texas; she had told them she would not be returning home with them, not just yet. The Earl of Dragmore had not been pleases, but he had allowed her to extend her stay in America with her relatives. Regina’s heart twisted. She was not going home with the rest of her family because her former beau Lord Hortense was there now engaged to someone else after her father had so decisively refused him. “A beauty like yourself, why, I would doubt you could have any man you wanted,” Mrs. Schroener said enthusiastically, standing with her charge at the window. “Father will you chose someone for me when I return home,” Regina said quietly. She and her chaperone were in the club car of the Southern Pacific Railroad’s Coast Line amid a dozen other first-class passengers. Most were gentleman, either engaged in conversation or involved in their dallies. She preferred not being overheard. Regina managed a smile, not wanting the kind old widow to know how much the prospect daunted her. She still loved Randolph Hortense. But it would not be. She could not go against her father’s wishes. She was not the renegade her sister Nicole was. And she was no longer eighteen. Had she been going home now, she would be entering her third season. When she did arrive back home, her father would present her with a list of suitable candidates for a husband, and she would have to choose one of them. “It’s really the best way,” Regina heard herself say. Regina smiled. “It was quite the event.” She and her family had come to Texas to attend the wedding, giving Regina the perfect excuse to escape England—and Lord Hortense and his fiancée. Regina murmured, “Undoubtedly,” her smile turning wistful. And it wasn’t a spectacular wedding celebration she was thinking of, but love. The love she could have had—but her father had denied her. Randolph was not a fortune-hunter, she told herself firmly, not for the first time. Not that it really matter. He was marrying someone else. Like her, he would do his duty by his parents. The train seemed to be slowing down. “You certainly should,” Regina told her. “The Hotel El Paso de Robles is one of the greatest health resorts on this coast, or so my aunt and uncle had said.” She was meeting the D’Archands there. After a long, relaxing weekend, they would head north to San Francisco where they lived. Regina intended to stay with them for the rest of the summer, having had enough of Texas. In September there would be no delaying the inevitable; she would have to go home and face her future. Regina had opened the heavy gold velvet drapes so she could regard the scenery. They were passing through rolling hills. The summer sun had dried the wild grass to a lemon-yellow, but the gentle hills were spotted with thick, lush green oaks, and the skies were spectacularly blue. From time to time she could glimpse the dry bed of the Salinas River as it snaked alongside them. Regina found the landscape rugged, yet the sheer vastness of it was breathtaking. “Someone has beautiful and nice as you deserves a prince,” Mrs Schroener declared, unable or unwilling to let go of her romanticism. Regina could only conclude that her chaperone was right. Reluctantly, she turned to take a seat. But before she could do so, a gunshot rang out. Her heart seemed to drop to her feet and the air to rush from her lungs. The sound of the gunshot echoed. It had been fired in one of the other cars, perhaps in the adjacent car, from which could now be heard screams and cries of fright. Mrs. Schroener gripped her hand. Another shot rang out. The shooting was definitely in the car behind them. Through the chorus of general hysteria, a baby’s crying could be heard. Oh, dear God! Regina thought frantically. It’s a robbery! Chaos erupted in the club car. The men were on their feet, milling about the woman pale and shaking with fright and shock. From the other railcar came another gunshot and a woman’s long, shrill scream of anguish. Regina never heard the sound before, but knew it was what it was—terror and grief. Regina and Mrs. Schroener were standing at the other end of the car, with all of the passengers between them and the bandit. Regina froze. She could not believe this was happening! Everyone obeyed the masked gunman, becoming motionless. The woman were sobbing, and one of the gentleman was also in tears. Roughly, the bandit reached out to the person closest to him, a young woman, tearing her ear-bobs from her ears. She screamed, and the man cuffed her. Regina watched her hit the wall and collapse, blood staining her beautiful pink-and-white striped jacket. The bandit leaned over her, ripping her necklace from her, too. The woman lay weeping. “Maybe we’ll take you with us,” the bandit sneered. When she screamed, he laughed, then rose to his formidable height. He turned to the gentleman closest to him and yanked a wallet out of his pocket, then went for his pocket watch. Regina was shaking. She was no longer shocked, no longer disbelieving. They were being robbed, and in a violent, terrifying way. The outlaw’s threat to the young lady rang in her ears. She could barely think. She was numb, terrified. But she was aware that the door was very close behind her, leading to the platform between this car and the one in front of them. Were there outlaws in that car, too? No sounds had come from it. Yet even if there weren’t, the outlaws—and she had not a doubt that there were several—would soon invade it, too. Regina’s heart was pounding. The bandit took a moment to look around the club car. His glance settled on Regina. For an instant their gazes locked. As he turned to rob his third victim, a young man, Regina felt panic overwhelm her. She shook. Sweat almost blinded her as she saw the robber raise his gun and hit the protesting gentleman with it. Her pulse roared in her ears. She swallowed a whimper, watching the bandit pocket a billfold and move to the next passenger. She did not want to see what would happen next. She moved. She shoved past Mrs. Schroener, who let out a startled cry. She ran the three steps to the door. She did not have to look backward to know that he had seen her. Regina ignored him. Terror beat quickly in her heart. She gripped the iron bar and wrenched open the heavy door, stumbling onto the platform. A sob tore from her mouth as she saw how fast the train was still moving. For she would have to jump from the train. A shot rang out again, time behind her, close behind her. He was shooting at her. She screamed, catching herself on the opposite rail, for one last second watching the hard ground speeding by so far below her. And then, without another thought, Regina hurled herself from the train.